It all started rather unexpectedly over 16 years ago. Brian Gooding has been there for most of that time. Here he looks back at his involvement with the magazine. The London Model Engineering Exhibition is always a popular show. James Hamiton went along to pick out some personal hightlights. John Hannavy spent New Year’s Day at Westonzoyland Pumping Station. 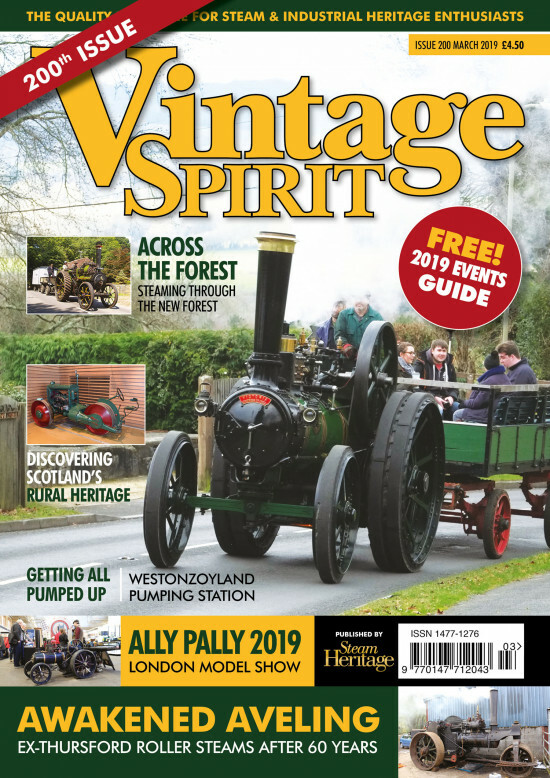 Peter Hammond looks back over 200 issues of Vintage Spirit and picks a few highlights of his involvement with the magazine. Aveling & Porter 8-ton road roller No.10780 moved once again under its own power in August 2018 after lying dormant for over 60 years. Jim Gerrard reports from Somerset. James Hamilton travelled out after Christmas to enjoy some winter steam on the road. Last summer’s Thames Traditional Boat Festival was the 40th such event. Brian Gooding went along to swelter in the heat. Phil Anderson discusses the challenges of working out the correct colours from old photos, in particular faded black & white ones. As the magazine reaches a milestone issue, Ken Rimell looks back at some of the highlights of his time with Vintage Spirit. The National Museum of Rural Life is a nostalgic reminder of farming methods in the 1950s. Bob Weir went to East Kilbride to take a trip back in time. Peter Brockington looks fondly at a well known lake steamer in New Zealand that has been plying the waters there for over a century. David Hargrave photographed Doug Hynd’s venerable Aveling engine as it headed across the New Forest and beyond towards last year’s Great Dorset Steam Fair.